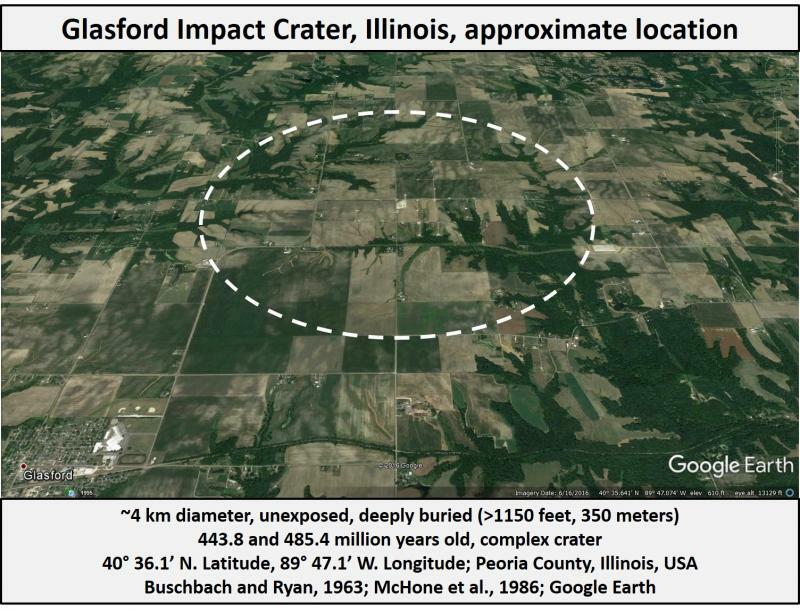 Glasford Crater is a 4 km (2 1/2 miles) diameter completely buried impact structure, located near Peoria, Illinois, in southern Peoria County. It is primarily described in Buschbach and Ryan, 1963. ﻿The impact structure is centered about 4 km (2 1/2 miles) northeast of the town of Glasford, Illinois. The Glasford impact structure represents a ring-shaped complex impact crater with a reported central uplift of up to 300 meters (1000 feet) (Buschbach and Ryan, 1963)﻿. Age: Buschbach and Ryan (1963) estimate that the impact occurred during the earliest Cincinnatian (about 451 million years ago), based on interpretation of stratigraphic and structural evidence, and provide a solid stratigraphic constraint at or before the lowermost expression of the Upper Ordovician Maquoketa Shale, and during or after the deposition of the Late Cambrian Franconia and Eau Claire Formations, both of which were observed as displaced and uplifted units within the structure. This means the impact occurred between about 443.8 and 485.4 million years ago. Dietz and McHone, 1991; McHone, et al., 1986. Other significant evidence: breccia, megabreccia, structural description in Buschbach and Ryan, 1963﻿﻿. Buschbach, T. C., Ryan, R. 1963. Ordovician explosion structure at Glasford, Illinois. Bulletin of the American Association of Petroleum Geologists, v. 47, pp. 2015-2022. Buschbach, T. C., Ryan, R. 1963. Glasford (Illinois) cryptoexplosion structure (abstract). Geological Society of America Special Paper 73, p. 126. Dietz, R. S., McHone, J. F. 1991. Astroblemes recently confirmed with shatter cones (abstract). Meteoritics, v. 26, p. 332. McHone, J. F., Sargent, M. L. and Nelson, W. J. 1986. Shatter cones in Illinois: Evidence for meteoritic impacts at Glasford and Des Plaines (abstract). Meteoritics, v. 21, p. 446.